In terms of the 1970s of American cinema, in my opinion, the most imposing individual was Francis Ford Coppola. Beyond his own creative output, which was obviously significant, he helped foster some of the most prominent filmmakers of the generation with relationships from mentor to collaborator with people like George Lucas, Steven Spielberg, and Paul Schrader. He was at the center of the new movement of American cinema that we’re still seeing the effects of today (most are still making movies, although generally just not at the same level of quality as when they first started). But back in the seventies, Coppola was king. From ’72 to ’79, he made four movies. All four were nominated for Best Picture at the Oscars. He won for two of them (The Conversation‘s loss was to his own The Godfather Part II). The second loss was to Apocalypse Now, which lost to Kramer vs. Kramer Now, I do really like Kramer vs. Kramer, but it’s nothing compared to the mad odyssey into the depths of the jungle that is Apocalypse Now. With the other movies on my list, I had little difficulty explaining to myself why I loved them individually. The disparate parts of each film assembled so easily together into something often beautiful that I found the experience of writing about them easy. 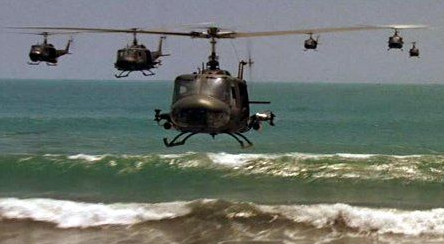 Apocalypse Now is very different. I really see it as a work of genuine madness. Coppola went into the jungle and lost his mind on the way out, the perfect mirror of the main character’s journey, and I really do feel like the movie captures that amazingly well. But then that leads to the question: How does madness lead to great art? How do you read an art born of madness? I think the only way to really approach it in an abstract sense. Its effect on the viewer as he watches it. There are arguments that all art should be approached that way, but I do personally feel that formal structural and character based approaches are important to both creating and taking in art, but Apocalypse Now largely forbears any formal approach. Long story short, this post is going to be messy. Let’s roll! Rewatching the movie for this post, I was struck by something that I’ve seemingly never really processed before. The movie is gorgeous to look at. The colors are vibrant with the wide range of greens of the jungle and the great palate of colors that fill in the gaps. The framing of every shot is beautiful, especially around the flight of the helicopters during the “Ride of the Valkyrie” scene. Even during smaller moments, like when Kilgore walks out of frame, it’s perfectly shot. Kilgore is crouching down, talking to Willard, ending on a melancholy note, and then proceeds to stand up and just walk to the right. We never see him again. He just disappears into the war. It’s such a perfect end for him, and it’s done through simple and effective framing. Well, you see, Willard, in this war, things get confused out there. Power, ideals, the old morality, and practical military necessity. But out there with these natives, it must be a temptation to be God. Because there’s a conflict in every human heart, between the rational and irration, between good and evil. And good does not always triumph. Sometimes, the dark side overcomes what Lincoln called the better angels of our nature. That quote outlines the idea at the heart of the film. The conflict between the rational and irrational and good and evil. What we end up seeing during Willard trek up the river into Cambodia is the increasing madness. Is that madness specific to the Vietnam War? The surface of the movie? Is that all there is? I don’t think so. I think that the surface is part of the equation, but also the least interesting part. As with all great art, Coppola uses the subject of his film to talk to more immediate and relatable concerns. Not much of the audience lived through Vietnam in country, but most of the audience has seen madness. They’ve understood obsession. They’ve understood being lost. They’ve also understood making a choice to turn back from madness. Many people consider the journey to Kurtz to be great, but once Willard actually gets there, for the movie to peter out. I disagree, the ending is my favorite part of the whole thing. I believe that part of the issue people have is with Marlon Brando. It’s not that he plays the part badly, but that he’s pretty obviously fat. He promised to show up lean and mean to the set, but he just loved eating too much to actually do what he promised. Coppola panicked. Kurtz wasn’t going to be the highly mobile killing machine as he was in the script. Instead, Coppola had to find another solution, choosing to shoot Brando mostly in shadow and turning what was supposed to be a thin man of action in a bulking heavy threat. I actually think that the combination of shadows that the man’s size, along with his insane ramblings makes him a rather terrifying figure. I consider the threat of madness infecting others to be a more imposing threat than a single man swinging through the jungle as some great killer, and by stripping Kurtz of the physicality of the character’s original ideal and leaving him with only the madness makes the madness all that much stronger in my mind. And besides, the actual death scene is fantastic, using the sacrificial bull to imply that Kurtz himself is a sacrifice, but to what? Is Willard killing Kurtz out of orders? He says no in the voiceover. I think that it’s a rejection of the madness in its entirety. What solidifies that in my mind is how Willard could obviously take Kurtz’s place, but he simply grabs Lance, the last member of the boat crew, and walks away. The movie is both a hard watch and an easy one. It’s hard because of the inhumanity on display and the questions that it raises. It’s easy to watch because of the magnificent cinematography on display and the great performances by everyone involved. In regards to the two versions of the film, I’ve only ever seen the original cut. I actually own the Redux version (the DVD I bought years ago came with both on the same pair of discs), but I’ve simply refused to watch it. I’ll probably do it one day. I’ve heard both good things (people saying that it finally completes the package of the movie and makes it great) and bad things (those saying that, in particular, the French plantation isn’t worth the price of admission and doesn’t add to the movie in any significant way). In the end, though, this work of madness by a madman who lost himself in the jungle is one of the most significant and greatest films made. A great companion piece, by the way, is Hearts of Darkness, the movie that Coppola’s wife made about the making of the movie. I like your take on this. I’m not sure that Coppola has one clear theme running through this film…..certainly there is the mission, the journey up river, the madness of almost all of the characters. Chaos and pandemonium surround everything. Kurtz talks of embracing horror, which seems to mean using evil methods in warfare…..evil as a means to win…..more madness…..playing nice seems to be a losing proposition. There is a Bruegel-esque quality to it. The scope of this movie is huge. It’s great art. There is a lot to see. I liked the Redux version just because it gave me more to look at. Characters come and go. The Kurtz plot is resolved but the rest of the story seems to continue without us……they float away from Kurtz’s village with hundreds of natives standing on the shore like orphans. All of the acting is great. I can’t imagine Harvey Keitel in the Martin Sheen role. Apparently he was sent home early in the filming proccess. I imagine his scenes as being similar to “Bad Lieutenant”. I like having questions unanswered at the end of movies. Questions linger.